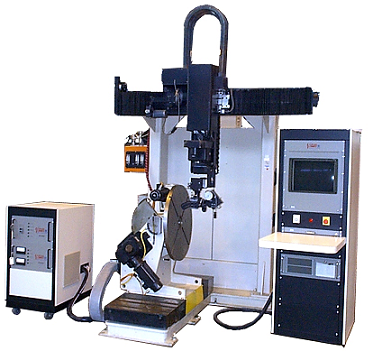 Servo controlled Rotary-Tilt Positioner capable of handling parts up to 1000 lbs. 350 Amp 100% Duty Cycle Modular Inverter Welding Power Supply configured with GTAW & PAW compatibility. Equipped with latest W2000 Control upgrades and Windows based Man-Machine Interface (WMMI). Supplied with a Portable Operators Pendant capable of controlling 9 Axes of motion and multiple wire feeders, axis speed, and incremental jogging with other display functions. Contact Sciaky for pricing, additional options & product information.